With a smooth and creamy texture, the spring brightness mask gives a lasting moisturizing and an immediate brightness for dull or dry skins. Matching a rich mineral water and a mixing of five nourishing and conditioning oils (argan, baobab, macadamia, sesame, avocado), this care gives your skin all the necessary nutriments for its balance an dits vitality. The pink pepperooms honey, the shea butter and the aloe vera offer essential soothing and regenerating properties. Enriched in anti-ageing actives (Hyaluronic acid, vitamin E, green coffee and hibiscus), it efficiently allows to hide wrinkles and lines and to struggle against time effects. Apply in thick layers on the the face, the neck and also around the eye. Let the skin absorb the actives for 10 or 15 minutes then take what is left off with a moistened cotton pad. 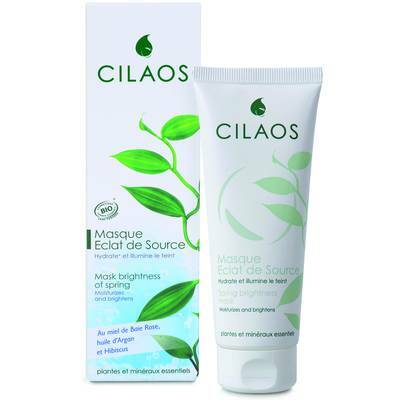 Main ingredients : Cilaos thermal water, Pink pepperrooms honey, Hibiscus, precious plant oil (Argan, Baobab, Macadamia, Jojoba, sesamum and avocado), shea butter, plant extracts (Aloe Vera, Vanilla bourbon, green coffee), Hyaluronic Acid, Vitamin E, bisabolol, cera alba. Aqua, Aqua de Cilaos, Aloe Barbadensis Leaf Juice*, Glycerin, Sesamum Indicum Seed Oil*, Cocoglycerides, Macadamia Ternifolia Seed Oil*, Cetearyl Alcohol, Bentonite, Sorbitan Stearate, Alcohol*, Mel*, Butyrospermum Parkii*, Cera Alba*, Argania Spinosa Kernel Oil*, Simmondsia Chinensis Seed Oil*, Hibiscus Sabdariffa Flower Extract*, Sodium Hyaluronate, Vanilla Planifolia Extract, Persea Gratissima Oil*, Adansonia Digitata Oil*, Coffea Arabica Seed Extract*, Tocopherol, Bisabolol, Cetearyl Glucoside, Benzyl Alcohol, Behenyl Alcohol, Capryloyl Glycine, Dehydroacetic Acid, Xanthan Gum, Palmitoyl Hydrolyzed Wheat Protein, Levulinic Acid, Sodium hydroxide, sodium Levulinate, Citric Acid, Terpineol.